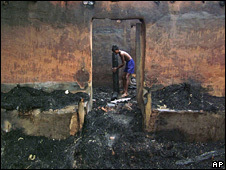 Anti-Christian riots have rocked several parts of India over the past month. The BBC's Soutik Biswas travelled to a remote region in the eastern state of Orissa, where the recent violence broke out, to investigate the complex roots of the conflict. A narrow ribbon of fraying tar snakes up from the plains of Orissa to the hills of Kandhamal, an unlikely setting for what is being described as the country's latest battle over faith. There is no railroad to this remote landlocked district dominated by tribes people. Here, they and a growing number of Hindu Dalits (formerly known as untouchables) who have converted to Christianity have lived together for centuries, tilling its fertile land, growing vegetables, turmeric and ginger. It is also the place which has been rocked by violence between Hindus and Christians over the past month. 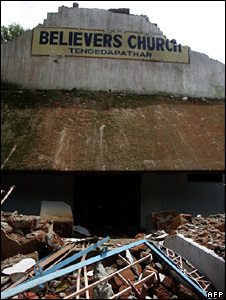 Events here have triggered off anti-Christian attacks in a number of other states. Villages have been attacked, people killed, churches and prayer houses desecrated. Radical Hindu groups have accused Christian groups of converting people against their will. Christian groups say these allegations are baseless. Kandhamal continues to simmer a month after the murder of a controversial 82-year-old Hindu holy man and the consequent rioting between local tribes people and Christians. Some 13,000 Christians are still living in tented refugee camps, with many having no homes to return to. The popular narrative is that the conflict is all about tribes people, egged on by radical Hindu groups, targeting the Christian community to put an end to the church and its growing influence in the region. 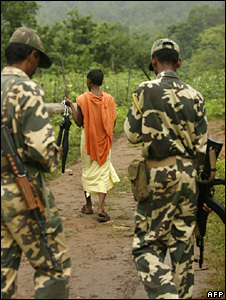 But that is only a small part of Kandhamal's tangled conflict. To describe it as a war over religion is to simplify it, say analysts and officials. They say it is essentially a decades-old conflict over identity, rights and entitlements. Faith is now being used as a tool to rake up and settle old disputes. A similar bloody clash between the two communities in the early 1990s that killed some 24 people went largely unreported because it did not assume a religious hue. 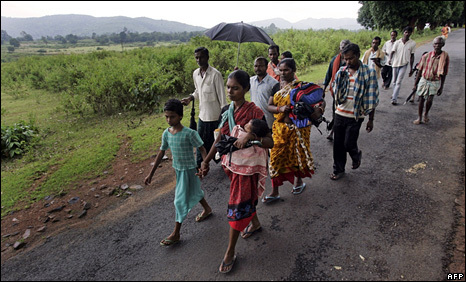 At the root of the conflict is the unchecked rift among the majority Kandha tribes people - one of Orissa's 62 tribal communities who make up over 22% of the state's population - and the minority Hindu Pana Dalit community who have converted to Christianity in droves. The Kandha tribes people comprise more than half of the district's 648,000 population and they openly say they are angry with their Christian neighbours. Unlike their counterparts in many parts of India who have been ignored, exploited or displaced, the isolated tribes people of Kandhamal, in the words of local officials, are "proud and assertive". Literacy among them has risen to around 40%, just under the 43% literacy rate for the district. Living outside the pale of India's oppressive caste system and on the margins of society with their animist practices, Kandhamal's tribes people have not found a good reason yet to convert to Christianity in large numbers. The untouchables on the other hand have borne the brunt of the caste system and have converted for a better life and more dignity. Resultantly, the Christian population in the district has leapt by 56% between 1991 and 2001, when India's last census was conducted, while the average population grew up only 18% during the same period. The pet complaint among the tribes people is that after converting to Christianity, their neighbours have become aggressive. They say they have grabbed their lands - land owned by tribes people in India cannot be bought under the country's laws - and used fake certificates to declare themselves as tribes people to take advantage of complex affirmative action benefits like government jobs. "The Christian converts have been stealing our crops and livestock. They are ploughing and taking away our lands using force, they are faking their identities to get jobs. They want to have the best of both worlds," says Lambodhar Kanhar, who heads an increasingly influential group local group of tribes people. Officials say there is merit in some of these allegations and they should have been investigated and settled a long time ago. The failure to do so has led to growing animosity between the two groups. "There are some issues. We are working to resolve the issues of land acquisitions and fake caste certificates," says the district's most senior official, Krishan Kumar. Things began to take a religious turn some 40 years ago when a Hindu religious man, Laxmananda Saraswati, arrived here. He set up schools and clinics, ran anti-liquor campaigns, openly railed against conversions and organised reconversions of some returnees to Hinduism. He also became popular among the tribes people because his ire was mainly directed against Christian converts. The holy man instantly became a target of his opponents, surviving some nine assassination attempts before he was murdered last month by a group of gunmen. There are reports of local Maoist rebels claiming responsibility, but officials rubbish this suggestion, saying that rebels do not gain anything by killing a Hindu holy man. By all accounts, Laxmananda Saraswati was both a revered and feared man: the first, for his social work; the second, for his rabble rousing against the minorities. He had clear links with the radical Hindu group, Vishwa Hindu Parishad, whose pamphlets describe him as a "formidable force against conversions by Christians" and somebody who "enlightened innocent tribes regarding their land rights". With his killing, what was essentially a movement for identity and rights mutated into a religious battle between the tribes people and the Christian converts. A spokesman for Orissa's Christian community insists it is basically a religious fight, provoked by radical Hindu groups who want to polarise people ahead of general elections. "Why is the violence happening now? The radical Hindu groups want to polarise people to benefit Hindu nationalist parties during polls. It is also part of a larger design to attack Christians," says Dr Swaroopananda Patra. Officials say that this is only a part of the problem. "It is a cocktail of problems: economic, ethnic, religious. Any of these factors can precipitate violence in these parts," says Krishan Kumar. What is clear that none of this would have happened if the state had carried out its duties on time - addressed the tribes peoples' grievances, prevented land and identity fraud and protected both communities from rabble rousers.